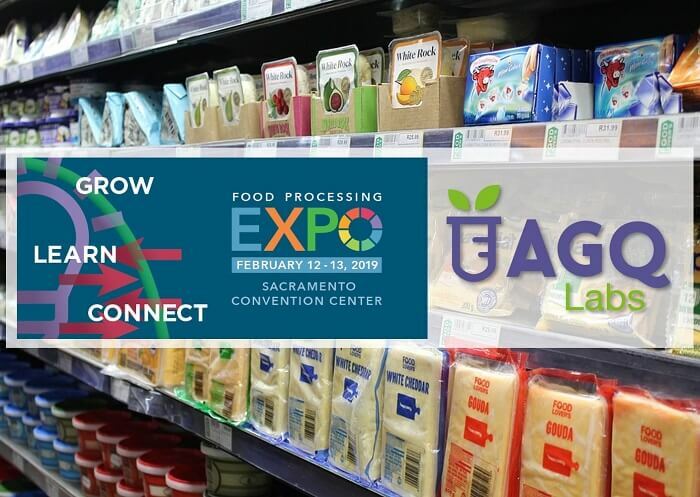 Join AGQ Labs for the Food Processing Expo on next February 12-13 at the Sacramento Convention Center at Booth 208! Our Food Safety Director, Patrick Brennan and his team will be attending all visitors at Booth 208. Come and join us! With more than 280 exhibitors and 2600 attendees, Food Processing Expo in Sacramento is the largest trade show in California devoted exclusively to food processing. The Expo brings the industry together by offering a trade show floor with exhibits featuring machinery, equipment, supplies, services and other vendors with innovative industry products. The Expo also features informative, topical educational sessions, dynamic speakers and networking events, offering something for everyone in the food processing industry. The Expo is produced by the California League of Food Producers. The California League of Food Producers (CLFP) is devoted to furthering the interests of the food producing industry before the California Legislature and regulatory agencies and is also a major representative for the California industry at the federal level. The food industry is full of different regulatory and industry requirements to demonstrate that food products are safe and of high quality. To do this, companies must partner with a Food Testing Lab as AGQ Labs with the most advanced techniques, accredited at the highest international level, and staffed with experts that are able to offer unique solutions to improve processes in product conservation and regulatory compliance. The U.S. FDA has set a limited number of action levels for heavy metals in food products. Action levels have been set for arsenic in apple juice and rice cereals for infants, as well as for lead in candy likely to be consumed frequently by small children. The FDA has also taken actions and refused entry of certain imports into the U.S. due to heavy metals. California’s Proposition 65 covers all food products. More details on Prop 65 can be found on AGQ Labs USA’s Prop 65 page. AGQ Labs USA uses an ICP-MS to test water and food products and an ICP-OES to test soils, vegetation, and food additives for heavy metals. AGQ Labs USA’s ICP-MS allows us to detect heavy metals at ultra-low levels to help ensure you comply with Prop 65.